In their raw form, a felt rock is technically a lump of felt formed when small bits of wool fluff gather while making polishing wheels for optical lenses, spun around in a drum with them. With steam and pressure, each stray piece of wool begins to entangle itself with others roughly creating a completely unique rock-like shape without the help of any bonding agents. 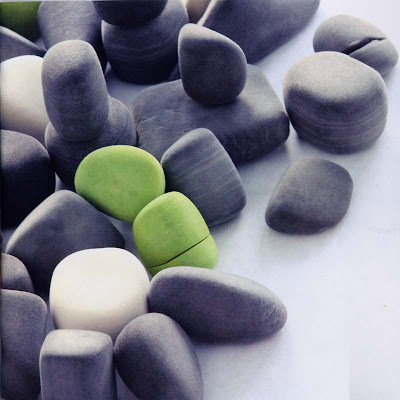 Each felt rock is then carefully selected by molo and then finished through their own process. 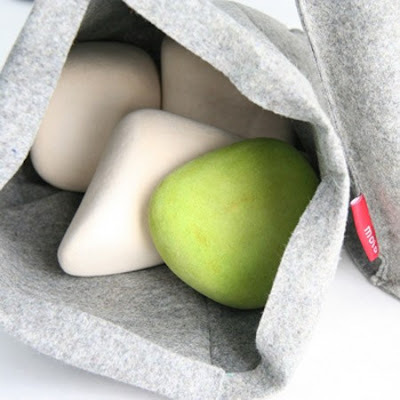 Felt rocks are solid all the way through, made out of 100% pure wool felt, and carefully dyed. they come in hand selected sets of 5 ( 2 natural and 3 grey, or 2 moss green and 3 grey ) and are packaged in a natural grey wool felt bag.